Welcome to my teaching and research page ! I am a Maître de Conférences at Université Aix-Marseille. I teach Computer Science at the Faculté d'Economie et de Gestion and I do research in the LIRICA team of the LIS laboratory. I used to be a PhD student at IRIF (ex-PPS & LIAFA labs, University Paris 7), then a research assistant in Dundee, and then a postdoctoral researcher in the FOCUS team, in Bologna. Feel free to contact me: first_name dot last_name_here at univ dash amu dot fr (prénom point nom arobase univ tiret amu point fr). The paper Intuitionistic Non-Normal Modal Logics: A general framework (joint work with Tiziano Dalmonte and Nicola Olivetti) is online. 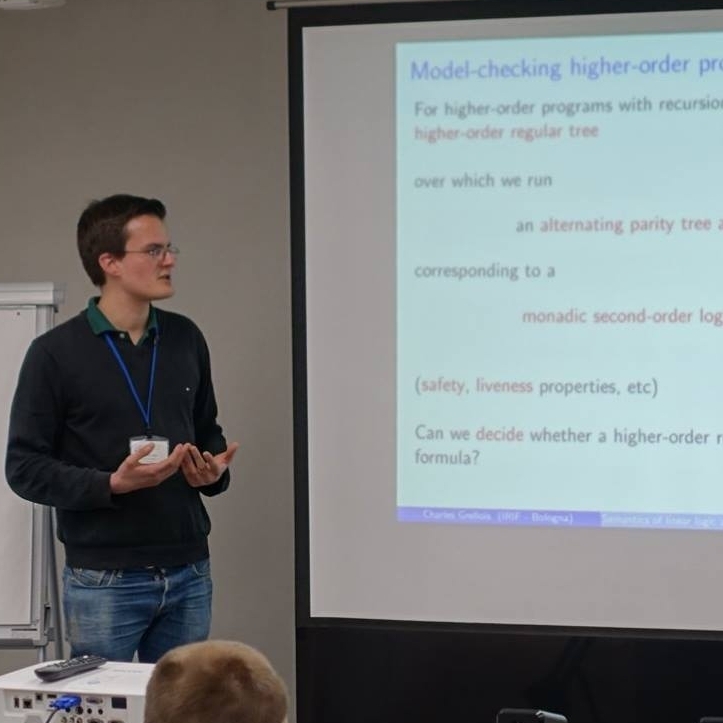 The paper On the Termination Problem for Probabilistic Higher-Order Recursive Programs (authors: Naoki Kobayashi, Ugo Dal Lago, Charles Grellois) has been accepted to LICS 2019. Preprint. The paper Probabilistic Termination by Monadic Affine Sized Typing (joint work with Ugo Dal Lago) has been published by ACM TOPLAS.